A guide to Beaches on Oahu, including addresses and lifeguard status. The most common result of contact with the man-of-war - the residual whip-like, red wavy, stringy welts on the skin from contact with the blue tentacle - is a painful papular-urticarial eruption. The shimmering turquoise waters in the tropical postcard of the Hawaiian Seashore is always invitingly picture perfect. In reality Hawaii is the most isolated land mass in the world- in the middle of the Pacific Ocean with seasonal storms and swells that bring rapidly changing ocean conditions even on sunny days. On the average, 12 people drown each year on Kauai alone. Often the victems are strong swimmers who underestimate the power of the local ocean current. Use caution and common sense to prevent tragedy. There are many safe places to enjoy the ocean in Hawaii. The life guarded beaches of Waikiki, Oahu, the shallow sandy waters of Kihei, Maui and the reef sheltered bays of South Kauai are generally safe spots for casual swimmers to enjoy the pleasures of ocean swimming and frolicking. Use wisdom in choosing time and place before jumping into the Hawaiian waters. Never depend on floatation devices. 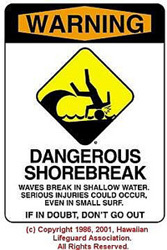 Be wary of river mouths and swimming in shoreline adjacent to urban areas after heavy rains. Talk to local surfers and life guards before getting in the water. * NEVER turn your back on the ocean! * WATCH children carefully and HOLD on to the younger ones. Do not depend on LifeGuards to watch young children. * NEVER attempt to swim at the water's edge during big surf. * BEWARE River Mouths can be deadly with strong current especially after afternoon or seasonal rainfall. * WATCH the surf for at least 15 minutes before entering the water. * NEVER rely on your board or leash as a substitute for swimming ability. * NEVER surf or bodyboard in big waves unless you are an expert. * NEVER swim in big surf if you are not a strong swimmer. * Be PREPARED for a wipeout! * IF IN DOUBT, DON'T GO OUT!